Microscope World Blog: Kids Science: Colored Flowers! This is a fun and easy kids science project that involves several parts. 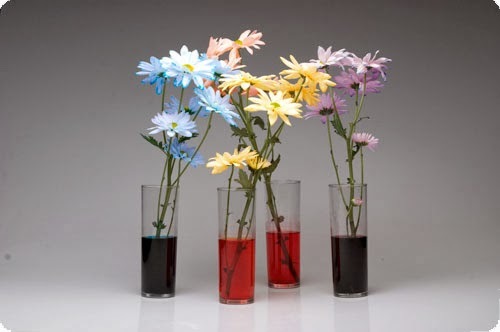 Fill each vase or cup about 1-2 inches full of water and add some food coloring until the water is dark. Once you have five vases filled with colored water, place the stems of five carnations each in a different vase of colored water. Take the final white carnation and look at the petals under the stereo microscope. What do you notice? Draw a picture of the structure of the petal as seen under the microscope. How long did it take for your flowers to soak up the food coloring into the petals? If you are preparing a presentation for your science class include this information in your report. Take one petal off of each different colored flower and look at it through your microscope. Can you see the route that the flower used to "drink up the water" and how the color seeped into the petals? Unlike humans, flowers do not have kidneys to filter out the food coloring so the petals simply change color when they are placed in colored water. If you would like to share the colored flowers with your class, they will remain colored even once you remove them from the water.